How to Use JioTV Play Without Jio SIM Card ? Note: For Method,1 you need to have a Jio number and Jio password. You can get it from any of your friends or relatives having Jio SIM. After few attempts, you will be successful in playing the JioTV or JioCinema app on your smartphone. Tip – If you have a Jio 4G data, you can just simply play a channel for a couple of seconds and then switch to any other network. I have also given a demo, check below. 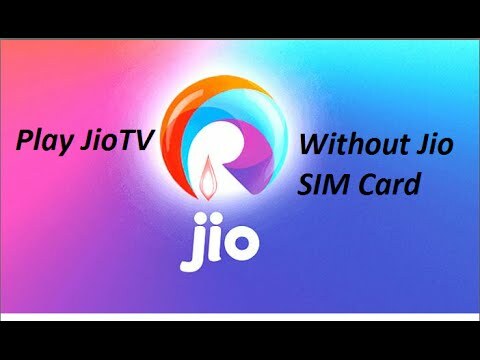 How to Use JioTV without Jio SIM Card ? You can even watch the JioTV Play without the ID & Password just downloading the Modded Apk file which does not require you to even download the MyJio App nor does it require you to enter the Jio ID and Password. You can even watch Star Channels on JioTV App itself without Hotstar App redirection. The app may not work on all the devices. If it causes some issues you need to retry for few times. Conclusion: This trick is for informational purposes only we do not endorse it. I hope the trick was helpful, do comment below for any assistance or support. Also comment below if any of the links are not working. If you've any thoughts on [Trick] Play JioTV Without Jio SIM Card, then feel free to drop in below comment box. is it possible to play channels provided in app without app i.e., outside the app via their stream link? how ? Yes, Available… I personally used it. Download any older version of Jio TV App for the trick to work properly. Thanks Buddy, the trick is working for older version. Search Apk file for any older version and the Jio Play will work like a charm. Can you please provide the link of any old apk? Or share google drive link here? Not working on iPhone. Is it for Android only? What if we’ve already made an account by jio number but now we wanna use the app by other sim…. So, will it work without downloading the older version of app again??? Plz do reply.. Better you use older version. Thank you so much sir….? Jio tv opens…. But not able to watch star channels as it redirect to Hotstar and then nothing happens….. Any idea ???? Hello,I’m from China, I,ve download JIotv,Please give me jio TV id or password,my email id: chenyun198012@gmail.com,thank you. could anyone share dummy jio id for trial ?? I have Jio Sim, I am in USA. My Jio number works to get my txt msg etc. I want to play Jio TV, a Jio Conema etc. please help. can u give me id and password plz..plz..
Is this still working guys? I recently switched to Jio. I am using a note 5 brought from USA , My 4G is working fine but for calls I have to have 4G connection otherwise I can not make or receive calls .. Can you please suggest something !! I have added a Modded APk of JioTV which can be downloaded. Thank You for bringing it to my notice. I have updated the same. Enjoy! Nikhil where is updated apk ? Say something …u done update ??? The JioTV works without MyJio just need Jio ID and Password. And Mod apk works on some devices. Great Man You are real MVP????? ????? You are great and so is your Mod apk. Also the JioTV works with ID and password on new versions. I am getting error – Oops! You must be on His network….. Since May, last updates receiving from Jio are getting install on Bluestacks, but everytime on clicking any program, showing “Unable to play this program at this time. Please try again later.” Can you solve this problem. Update is mandatory, there is no Cancel Button receiving in popup. I’m getting only ‘Update’ button, there has no ‘Cancel’ button ???. Hi Nikhil, need help to remove this mandatory update restriction on the mod.apk. Appreciate if you could upload latest apk. mandatory update pop up is still there. Also while clicking on the link it shows file uploaded on 02/June? Could you please check. Can u play star channel by this trick?? You can watch the video above and mod the App. Read the post carefully. You will find the link for Mod Apk Cheers! New updated file works like a breeze. Awesome work Nikhil. Thank you. You are a Rockstar! Hi Nikhil. I could not locate Mod apk for Jio Cinema on your website. Could you please share the link here. Mod app requires ID & Password! Bevkoof agar jio ki sim friens se leni hai tph khud ki bhi khareed lenge….. In some devices it may cause probelms. Thanks Nikhil, But it’s really quite bad experience while running Emulator on Windows system , do you have any idea how to run JioTV on IOS & Windows without Jio Network not using the Emulator as well. Presently I have not found any such but will surely let you know if any. Cheers! There is no Cancel button on the Recommend Update pop up. from yesterday its started asking for mandatory update so unable to use the app now. can you provide new mod please. Its stopped working now. Days an update is required and closes the app. Hello again Nikhil. There is an update pop up again with no cancel option. Could you please update the apk file. Thanks. This trick no more works for update version 5.1.2.
i am having apple iphone 5.can i use that trick on iphone.please tell me where i can download old version of jio app for iphone. Hey! Nikhil, thanks for modded jioplay app its working fine now. I just downloaded it and its working like charm just like before, and gave you +1 for google aswell. Thank you! Its working fine now. unable to play,try again in some time. The first thing you need to do is connect to a VPN with Indian Server and the second thing is fake your GPS location as if you are in India. First thing you need to do is connect to a VPN with Indian Server and the second thing is fake your GPS location as if you are in India. Which VPN server and how to fake location? Hello! Nikhil, thanks for modded jioplay app its working fine now. Hi Nikhil, I am using Jio tv apps for the last two months but after its update my android box showing only half screen for jio tv. I have checked all the setting and even reset the box also but could not find out solution. But the others apps like ditto, sonyliv are working fine. New update has come for jio tv with 499 channels…any updated apk? The mod works well for Jiotv or JioPlay. However is there a mod for jiocinema also? Jiocinema is not added above only JioPlay links are given. Channels are not playing for some reason. Is the same for others? From afternoon I’m unable to play past programs, I can play live TV only that’s it, please help me in solving this issue, ASAP. Hi guys..past program is not showing on jio tv app…any solution for same.? Please update asap..
Hi Nikhil. Apparently it is giving an unknown error when i try to play any channel. Any help you can provide? Only live channel is working… Past program can not be viewed. Plzz provide any solution… Not able to see previous days programs. Try app from other link available. After every 5 sec , error appeared. Not working now. Hi Nikhil, thanks for the modded app. I was wondering if there is any hack for location? I used this app for long time from abroad but now it doesn’t work anymore. I tried to hack it but not successful . Do you have any idea? Just download fake GPS location App and also a VPN App with Indian Server, done. Hello, I am from USA have install all moded version but only Download Linke 3 works for me which gives me Update thing without cancel button and the Updated Aug on and Download link 2 brings me to sign on page and when I hit skip it puts me back on my home screen please tell me how to fix this or could you please tell me know to go around the update thing ? would appreciate it a lot. Try VPN with Indian Server and also mock location as India. Download MyJio app login with and then try JioPlay TV. I have tried VPN and fake gps location but still error comes after 5 seconds later on all channels. Download MyJio App then try with JioTV. Hi Nikhil. Issue is not VPN or mock location. I have tried both and still channel stops playing after few seconds with an error msg. I moded the app, but its not working in samsung phone, earlier only star network channels were not playing in hotstar, now all the channels are not working, it says please try again later. How to watch jio TV on TV using Chromecast without mirroring. It depends on your TV. My question is can you mod Jio app with chrome cast feature. I wish you could fix the issue with catchup. 🙂 cheers buddy! Earlier this mod use to work fine on my phone but recently its not working any more. Don’t know the exact reason behind this. Please see if you can find any solution. I am working on it. Stay Tuned. Its not working pls check and fix the issue bro. Installed your latest apk (download link 3). Successfully installed on my Mi Box 3. On the sign in screen after entering Jio ID and password, though sign in is enabled, not able to click on it. I have jio sim and now i want to play jio music in pc with same credential is it possible?? Can you send me one username and password? Hiii.. Can we use one jio number to access more than one jio tv??? Been following the blog for a while, thanks for taking the time to update the app bro. I was wondering whether the apk will work an Android tv box using a VPN pointed to the Indian server? My friend who tried it said he keeps getting an error message saying “Not connected, connectivity issues” even though he is on a high speed connection and all other apps work fine. Actually, I am working on fixing the issue. The latest update from Jio is causing some issue, but once a new update is released I will surely test it and upload the mod APK. So do follow the blog and sub us. It gives me error as unable to process request right now. Please check your connection and try again. Any solutions? I am working on it. Once JioTV update is released I will fix the issue. Sorry, for the inconvenience caused. Installed from 1st link. I get userid and password link. Getting error : ” Unable to process your request now. Please check your connection and try again.” I downloaded from Method 2 [Updated] Download Mod Jio Apk. Can a mod apk be created wherein JioTv can work outside India without VPN? Sorry to hear that. Try any other alternative. Hello, how are you ? I know you do not know me. But i know you have been hurt for a while but you have seen your article. now almost every day that i read your article and i love it. hopefully your article will look good in the future as well as hopefully it will be good and may god bless you. what values are modified in the app to play without jio sim ? could you share user name and password. I am from Kuwait. Working perfect in my Mobile and My Smart TV too.. only stars channels redirect in hotstars… else superb.. v 5.6.0 only with real jio number + id require..